THIS WEEK’S OTHER FEATURED BOOKS, “INCIDENT IN PATAGONIA,” BY ISABEL GARCIA CINTAS, AND “THE SPIRITUAL AWAKENING PROCESS,” BY CHRISTINE HOEFLICH, CAN BE FOUND BY SCROLLING DOWN BELOW THIS POST, OR BY CLICKING THE AUTHOR’S NAME ON OUR AUTHOR’S PAGE. 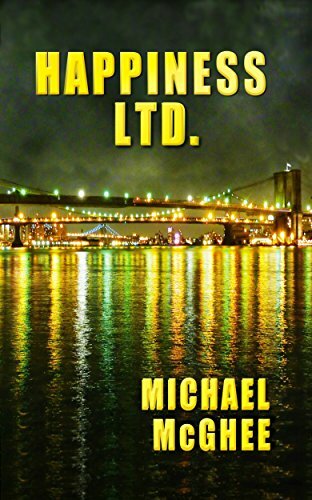 SUMMARY: Happiness Ltd., by Michael McGhee, is a darkly comic dystopia novel set in New York City of the near future, where multiple hurricanes have turned downtown into crumbling marshland; where citizens have signed over their civil rights to corporate sponsors; and where threats to the consumer state are considered terrorism. When Nelson Young, an employee of Happiness Limited, falls in love with Celia, a disenfranchised rebel, he becomes a liability to his employer. Nelson and Celia try to escape, but are charged with “economic terrorism” and put on trial for their lives. THE BACK STORY: The roots of the story go back to 2003, when my wife and I moved to an apartment near “Ground Zero” because the city was offering subsidies to anyone who would live there, in an effort to help downtown recover from 9/11. It was a paranoid time. Washington was creating the Patriot Act and the surveillance state that Edward Snowden would later expose. At night I would walk our dog around Ground Zero, where soldiers stood guard with machine guns. Yet at the same time, the nearby neighborhood of Tribeca was bouncing back with trendy little restaurants and bars. It felt like people were partying at the end of the world. These strange juxtapositions gave me the idea for a novel about Manhattan in the not-distant future, where the sea levels are rising and the surveillance state has become a police state, yet the city remains (as it has always been) a crazy unmanageable stew where the super-wealthy live side by side with the destitute and where love or mayhem can break out at any time. WHY THIS TITLE? : It’s an ironic title: Happiness Ltd. is the name of the corporation that controls all corporations, and promises “happiness” to consumers who are willing to give up their civil rights. WHY WOULD SOMEONE WANT TO READ IT? Anyone who enjoyed “1984”, “It Can’t Happen Here,” and other great dystopian novels, and/or is frightened by the trends in our society today, is likely to enjoy Happiness Ltd.
Michael McGhee is a pen name, which I use because I work for a company that might not like this book. 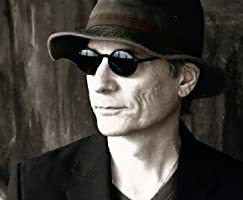 I have lived in New York City for almost 30 years, but grew up in Chicago and spent several years hitchhiking around the U.S., Mexico, and Canada before marrying, having kids and settling down. I have built a career as a journalist and writer, but was at various times a taxi driver, short-order cook, house painter, antique furniture refinisher and stained-glass repairer, among other pursuits. AUTHOR COMMENTS: Happiness Ltd. was published two years ago, but since the election of Donald Trump to the White House, the story is more relevant than ever.